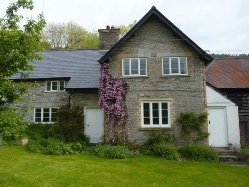 You can rent either the Lodge Cottage or the Old Farmhouse. 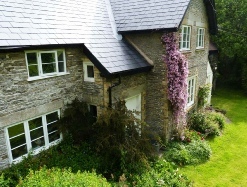 Or, you can rent both cottages together and join them up through an internal door. Except at peak times, you can also book a short break of 3 or more days. Mid-week short breaks are cheaper than weekend short breaks. 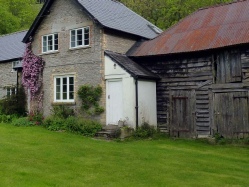 Electricity, linen and towels for one double bed, and logs for the woodburning stove are included in the basic rent. Returning guests, note that the old electricity meter in the Lodge Cottage is no more - there’s no need to bring £1 coins! Is there a phone? Is there TV or wi-fi? We don't provide a TV. We think it's not what people need up here. There is a land-line phone for you to use. However, you're unlikely to get reception for your mobile phone unless you climb up the hills out of the valley bowl. We don’t have broadband or wi-fi. We do provide loads of books, board games, and a music system in both cottages. Our base rental includes linen and towels for two people sharing a double bed. If your party is larger, check the accommodation details and let us know when you book how many double, single and sofa beds you need linen and towels for. We set the charges for linen and towels (£14 double; £12 single or sofabed) only to cover our costs. Can I bring my own linen and towels? Yes, and if you let us know when you book, we'll reduce your base rental cost by £14. Lodge Cottage: 3 steps from lane to door; 2 stairs up to downstairs toilet and washbasin; flight of stairs to bedrooms and bathroom. Old Farmhouse: 2 steps from lane to door; no downstairs toilet; flight of stairs to bedrooms and bathroom. Will there be anyone next door? Often there'll be no-one next door, but sometimes there'll be other guests. If there are, you'll be sharing access to the garden, the woodshed, and the phone line. There should be enough garden furniture and space for all. The thick stone walls are good at insulating sound. In most cases a controlled and well-behaved dog will be welcome, but please discuss this with us at the time of booking. Note that this is a farming area with many sheep and other livestock, and it’s your responsibility to ensure there isn’t any disturbance to them and to other guests.